The salaries and benefits of postal workers are typically negotiated between the US Postal Service and the appropriate postal labor union. There are several labor unions representing the rights of different types of postal workers. The four largest labor unions are: American Postal Workers Union (APWU), National Association of Letter Carriers (NALC), National Rural Letter Carriers’ Association (NRLCA), and the National Postal Mail Handlers Union (NPMHU). Each of these four unions has separate agreements with the USPS regarding postal wages and benefits. These unions represent the vast majority of postal workers. There are, however, other post office positions whose pay and benefits are managed separately. Letter Carriers are the most visible post office job. Sometimes referred to as mail carriers, postal carriers or mailmen, letter carriers are responsible for delivering mail to businesses and residences in cities and towns. Letter carriers wear the typical “mailman” uniform and drive USPS owned vehicles. Letter Carriers are represented by the National Association of Letter Carriers (NALC). NALC is the sole representative of US Postal Service letter carriers and has about 300,000 members. When you first start working for the USPS as a letter carrier, you will enter as a City Carrier Assistant (CCA). CCAs are non-career, bargaining-unit employees who are hired for terms of 360 days. CCA employees can be converted to full-time regular (FTR) employees depending on vacancies and their relative standing. The current hourly wage for a new CCA is $15.68 (going up to $16.06 on 11/16/2015). CCAs also receive a night differential rate of an additional $1.16 per hour for all time worked before 6:00 am and after 6:00 pm during a work day. In addition, CCAs are paid overtime (1.5x hourly rate) for all work over 8 hours in a work day or 40 hours in a work week. Additionally, CCAs will receive double time for work over 10 hours in a work day or 56 hours in a work week. TIP: You can find and apply for Post Office jobs like letter carriers online. USPS employees that work as clerks, motor vehicle services or maintenance services are represented by the American Postal Workers Union (APWU). The APWU has about 200,000 members and also represents workers in support services, information services, mail equipment, material distribution, and operating services facilities. 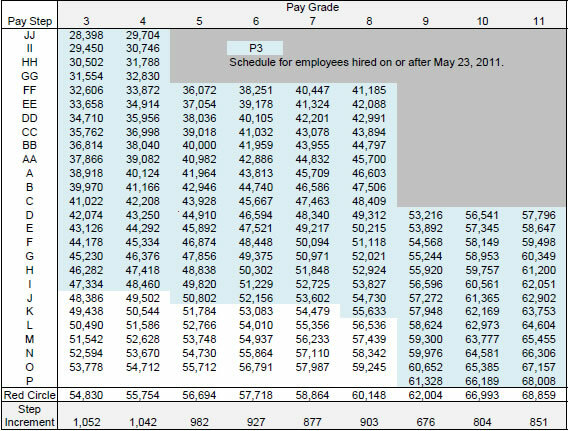 The various post office jobs have separate pay grades. 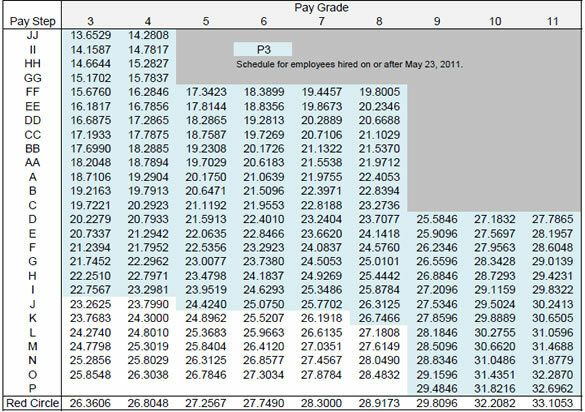 The salary information for the various pay grades (and pay steps) are shown below. Rural letter carriers deliver mail to rural businesses and residences in the United States. Rural letter carriers act as a mobile post office by providing services such as: selling envelopes and stamps, confirming signature and deliveries, and collecting mail and packages. The union that represents the rural letter carriers is the National Rural Letter Carriers’ Association (NRLCA). The NRLCA was founded over 100 years ago and currently represents over 100,000 rural letter carriers. 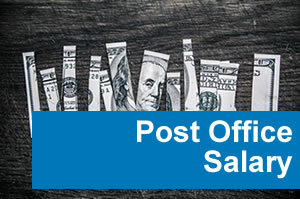 The latest agreement between the NRLCA and the USPS specifies that the starting salary for new rural letter carriers is $36,577 (for a 40 hour route, effective 9/7/2013). For new part-time flexible employees, the starting hourly basic rate is $18.29 per hour. These wages are subject to cost of living adjustments (COLA) based on the Consumer Price Index for Urban Wage Earners and Clerical Workers published by the US Department of Labor. At US Post Offices and mail processing facilities, mail handlers are responsible for processing the mail from collection until it is turned over to the carriers for final delivery. Typical responsibilities of a mail handler include unloading, sorting and packing, and reloading mail and parcels. The National Postal Mail Handlers Union (NPMHU) represents the rights of 47,000 USPS mail handlers. For mail handlers hired after 2/15/2013, the annual salary ranges from $31,986 (Grade 4, Step BB) to $56,750 (Grade 5, Step P). Mail Handler Assistants receive an hourly rate of $14.37 for Grade 4 or $15.15 for Grade 5. The benefits of Postal Service workers are similar to those enjoyed by Federal Government workers. Employees of the postal service are often members of various unions, such as: The American Postal Workers Union, the National Association of Letter Carriers, the National Postal Mail Handlers Union, and the National Rural Letter Carriers Association. The Federal Employees Health Benefits (FEHB) Program provides the health insurance for postal service workers. The program provides both excellent coverage and flexibility. More importantly, most of the cost is paid by the Postal Service. Both traditional insurance coverage and Health Maintenance Organizations (HMOs) plans are available. Postal Service employees are covered under the federal retirement program. The retirement plan provides a defined benefit annuity at normal retirement age as well as disability coverage. In addition, some postal employees may contribute to a Thrift Savings Plan (TSP), which is similar to 401(k) retirement savings plans. Employees contributions to TSP are tax-deferred. After a waiting period, employees may also receive matching contributions up to 5 percent of pay. Postal employees are covered under Social Security and Medicare. The postal services fully pays for basic life insurance coverage through the Federal Employees’ Group Life Insurance (FEGLI) Program. Additionally, employees are given the option to purchase additional coverage through payroll deduction. After one year of service, employees may participate in the postal services’ Flexible Spending Accounts (FSA) Program. Contributions to FSA are made pre-tax (which makes them a great tax savings benefit) and can be used to cover most out-of-pocket health care and day care expenses. Full-time employees earn 13 days of vacation per year, increasing to 20 days after 3 years of service, and to 26 days per year after 15 years of service. In addition, postal service workers receive 10 holidays off each year. Finally, full- time employees are allowed to use up to 13 days of sick leave per year due to illness or accident.